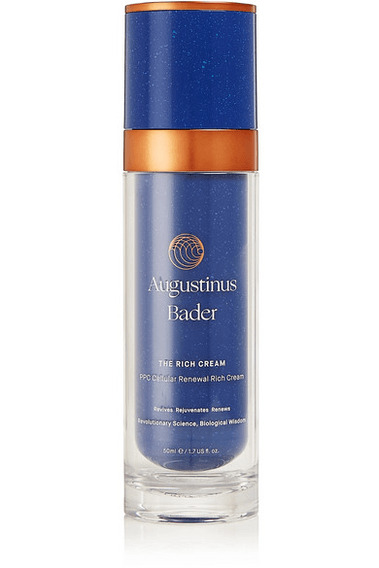 World-leading stem cell and biomedical scientist Augustinus Bader created 'The Rich Cream' to drastically transform your complexion - just look at Dakota Johnson, Demi Moore and Diane Kruger's flawless skin to see the amazing results. Infused with the brand's rejuvenating Trigger Factor Complex (TFC8®) technology, this deeply hydrating complex works to reduce signs of aging and protect from environmental aggressors. It's a fast-absorbing, weightless formula that will leave you with a visibly radiant and youthful appearance. - Suitable for normal to dry skin types - Free from parabens, fragrance, mineral oils, SLS, SLES, DEA - Replenishing Argan, Avocado and Evening Primrose Oil are rich in anti-oxidants and help protect skin from free-radicals -Instructions for use: - In upward, sweeping motions, smooth two pumps over the face, neck and decollete. - Apply to dry, cleansed skin - 50ml/ 1.7 fl. oz. Ingredients: Aqua (Water), Helianthus Annuus Seed Oil, Pentylene Glycol, Squalane, Octyldodecanol, Argania Spinosa Kernel Oil, Ethylhexyl Stearate, Persea Gratissima (Avocado) Oil, Tribehenin, Polyglyceryl-3 Polyricinoleate, Sorbitan Oleate, Butyrospermum Parkii (Shea) Butter, Sorbitol, Oenothera Biennis (Evening Primrose) Oil, Tocopheryl Acetate, TFC-8, Disteardimonium Hectorite, Magnesium Sulfate, Panthenol, Butylene Glycol, Cera Alba (Beeswax), Lactic Acid, Lanolin Alcohol, Zinc PCA, Dextran, Palmitoyl Tripeptide-8, Citric Acid.